Double Operator / Double Nozzle. For storage of wax, a Solid Aluminum tank used. The outer body of the injector is made from M.S and powder coated. The transparent Acrylic top fitted with safety valve/ pressure gauge / input valve. The thermostat utilized is of high accuracy range from 80C-100C0 and is made in Germany. FHB KB-30 Imported heater 500 watt is used for heating purpose. The entire tank is covered by 120 density ceramic - wool. Operating voltage 230V/AC/ Single phase. Machine is offered warranty for one year - no warranty for heater. 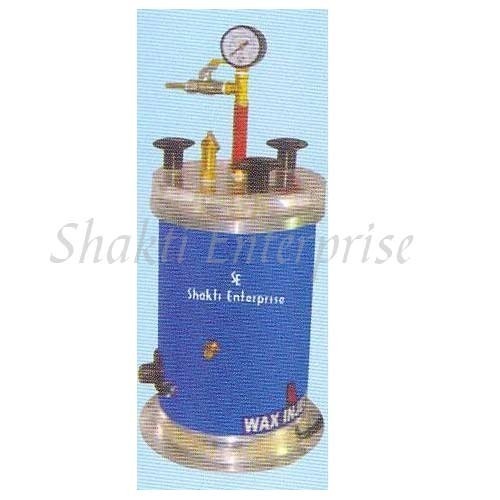 Aluminum tank is provided for quick heating of wax. Wax Capacity: 2.5kg / 3.5kg. Available with / without manual pump. Pressure regulator provided with safety valve.